There are many reasons why I have chosen to live an uncluttered life, and one of those reasons is that I’m lazy. If I need to do something I’m not super excited about doing, I want it to take the least amount of time possible and I want it to cause me little or no stress. I’ve created simple routines for things like cleaning and getting ready in the morning because I need to do these things but don’t want to waste mental energy on them. An example of this is processing mail when I come home: I instantly shred, recycle, or respond to the mail right when I walk in the door. This routine usually takes me two to three minutes, and then I don’t think about the mail or see it again. I used to just collect it and place it on the dining room table, then I would have to touch it again to move it so that we could sit down to dinner, then I would see it after dinner and think about it again, and then I would have to deal with it after worrying about it some more. In the past, I would spend 15 to 20 minutes thinking about the mail each night. Being “lazy” and organized with my mail saves me quite a bit of time over the course of the year. That, and I never have to worry about paying bills late. It may seem paradoxical that Do Less can mean you’re more productive — and if you define “productive” as meaning “get more done” or “do more”, then no, Do Less won’t lead to that kind of productivity. But if instead you define “productivity” as a means of making the most of your actions, of the time you spend working (or doing anything), of being as effective as possible, then Do Less is the best way to be productive. Consider: I can work all day in a flurry of frenetic activity, only to get a little done, especially when it comes to lasting achievement. Or I can do just a couple things that take an hour, but those are key actions that will lead to real achievement. In the second example, you did less, but the time you spent counted for more. Let’s take the example of a blogger: I can write a dozen posts that really say nothing, mean nothing, but take up my entire day … or I can write one post that affects thousands of people, that really reaches to the heart of my readers’ lives, and takes me 1.5 hours to write. I did less, but made my words and time count for more. If you’re lazy, as I often am, then the choice is simple. Do Less. But do it smartly: Do Less, but make every action count. Send fewer emails, but make them important. Write fewer words, but make each word essential. Really consider the impact of every action you take, and see if you can eliminate some actions. See if you can achieve a great impact doing less. This doesn’t mean “less is more”. It means “less is better”. I don’t agree with everything in his post, but his viewpoint speaks to the heart of uncluttering. Read his post and then come back here to share in our conversation. I’m interested in reading about what your views are on lazy productivity. Professional organizer extraordinaire Monica Ricci gives a grounded perspective in her guest post on the process of uncluttering and organizing. You can follow Monica on Twitter, Facebook, and her blog for more organizing tips. Deadheading. It sounds like either a grisly ritual or a summer vacation following your favorite band on tour. But it’s neither. Deadheading is simply the practice of removing the dead flowers from a plant. The reason you deadhead is because if you don’t, the flower will stop blooming, and how disappointing would that be? 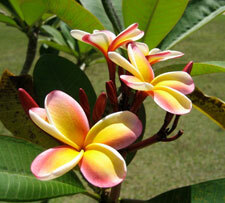 All plants have one goal — to go to seed so they can perpetuate their little flower family. Creating flowers is part of that process, and if you leave the dead blooms on the plant, it will stop blooming and concentrate on going to seed. However, when you interrupt that cycle by removing old blooms, the plant then puts its energy into strengthening itself and producing more flowers in a continued effort to go to seed. The more you cut off the dead blooms, the more fresh blooms you’ll get. This is a lot like organizing your life. The more you clear out and eliminate what’s “dead” in your life, the more space you create for opportunity, love, and success in the future. You have more energy to put toward strengthening yourself and blooming even more gloriously than you did before. MSN Money discusses the high price of clutter. I know plenty of people that have successfully groomed their goatee without the aid of the GoateeSaver, but is the upkeep of those goatees that big of a pain? 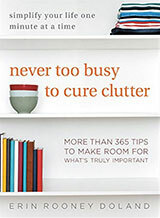 Gretchen Rubin of the Happiness Project provides great ideas for quick clutter-busting activities. This week’s entry uses flower pots, baskets, boxes, and all sorts of unconventional items to store objects in her scrapbooker office. Professional organizer Geralin Thomas provides the ultimate guide for throwing the perfect yard sale. I thought I knew what extreme car cleaning was. I was wrong. The size and upkeep of our 2800 square foot Victorian home is just too much for us. I’m still keeping my kicks, no matter what the extreme minimalist says. Having a baby can really test your ability to keep a tidy and uncluttered home. Some tips to make your security check easier. Organization systems to prevent you from having to run to the store at the last minute, and you won’t have to worry about forgetting anyone’s special day. I know I enjoy monogrammed food much more than non-monogrammed food. One of the major reasons people hold on to stuff is the emotional attachment they assign to an object. 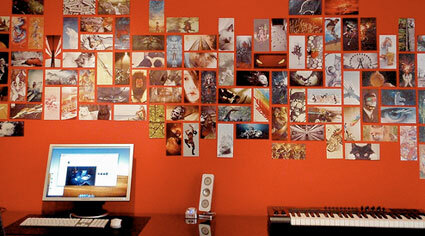 The Unclutterer Flickr workspace group is full of inspiring photographs from our readers offices. Ask Unclutterer: Can a bathtub be clutter? We have a lovely large whirlpool bathtub in our master bath that we never use. When we bought our house last year, it was a nice selling point, but now it just collects dust and goes unused. What should I do with the extra space? Or how can I minimize cleaning something I never use? Kate, do you live in my house? Do you read minds? Honestly, this is the exact situation in my home. I have a stall shower that is used daily and a large, whirlpool bathtub that only is used when we bathe our cats. It takes a ridiculous amount of time and water to fill the bathtub to reach the whirlpool intake sensor, so we rarely use it. In my case, I clean the tub immediately after I use it. 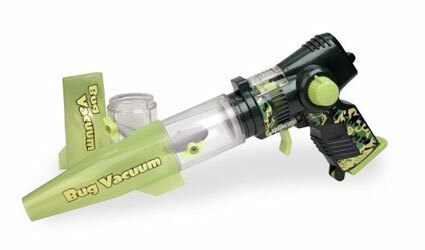 The other times I just dust it with a dry cloth when I clean the bathroom. I am at a loss for what to do with your situation otherwise. I hope that our readership chimes in the comments section and gives both of us advice for how to handle the situation. Like you, I feel that the whirlpool tub is clutter, but too expensive to remove (both in replacement cost and home value). Thank you, Kate S., for submitting your question for our Ask Unclutterer column. My apologies for not having a solution — but I’m sure checking out the comments will help both of us. Multiple small objects can easily look cluttered when they are displayed, even when they are all on a similar theme. The reason I chose this week’s workspace is because although the tiny art prints are different from card to card, there is nothing cluttered about this collection. Working in this space would be extremely inspiring — not distracting — and that is something to be admired. I think the bright wall color helps the collection stand out and look more organized, but so is the overall arrangement of the pictures. I really think this is a great space. Not only does knowing how to properly use your kitchen utensils save you time, space, and money, but knowing additional uses for your utensils can have the same effect. 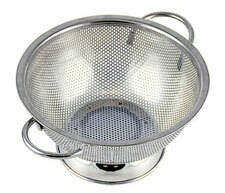 Earlier this week, the DIY Life blog wrote about “10 Clever Uses for Colanders.” The post, written by Diane Rixon, includes some smart ideas for making multi-uses with this large piece of kitchen equipment. Check out the full list of 10 and then come back here and share more of your ideas for creative uses for colanders and other kitchen utensils. This week on Unclutterer has been filled with numerous links to helpful articles on other sites. I’ll be honest, the first part of next week is going to be the same. Lots and lots of links — good links, hopefully — but lots of links. Why all the links? On Monday, my husband and I became parents to a beautiful baby boy. Our little man is an excellent sleeper, so I’ve been able to find great things around the internet to share with you and comment on while he has been napping, but my mind is a bit overwhelmed and original content isn’t flowing. Since we are adoptive parents, parenthood caught us (pleasantly) a bit off guard. My first link of the day is to a book review professional organizer Julie Bestry wrote about Everything I Know About Perfectionism I Learned from My Breasts. This book, written by the talented organizer Debbie Jordan Kravitz, has been on my to-read list for months but I haven’t yet reached it in the pile. Julie’s review of Debbie’s book, however, has convinced me to jump it ahead on my list. And, since it persuaded me to read the book, I thought it was a review you might wish to read as well. As a breast cancer survivor, Debbie’s revelations about the necessity of overcoming her perfectionist tendencies (for her own sake as well as her family’s), informed her desire to write this book. But, to be honest, until I had a copy in my hands, I think I was expecting a memoir, even a breasts’ eye view, as it were, of how her cancer and recovery brought Debbie to some sort of epiphany about the challenges of fighting perfectionism. 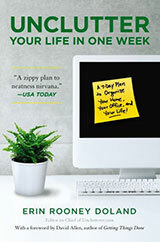 In fact, while Debbie does share her own story, this book offers much more, both to those of us who struggle with the ideals of perfection and those of us who have friends, family and co-workers whose perfectionism drives their own behaviors. Everything I Know is informative (indeed, eye-opening) about perfectionism, but also offers practical guidance and motivation to those seeking to become recovering perfectionists. The subtitle of the book, Secrets and Solutions for Overpowering Perfectionism, explains the direction of the text — and shows that this isn’t a book just for women. Know Your Stuff helps you create a room-by-room inventory of your personal possessions. LG may have created the ultimate space saving laundry solution in the All-In-One Washer and Dryer. While I’m waiting for the perfect Netflix player to come along Engadget is reporting that LG has a Blu-Ray player that will stream Netflix content. Do you have limited space? This new two-person table from Japan might be for you. The second installment in this series discusses features of home fireproof boxes and off-site digital storage devices. Both storage methods are essential if you’re looking to be organized in times of emergency. Laying items out may enlighten you to the fact that you have much more junk than you first thought. If you are looking for a double boiler, you may want to check out this silicone collapsible alternative. While at her local Nordstrom’s Department Store, my friend spotted the piano player using a MusicPad Pro for his sheet music. It’s a digital device, much like a Kindle, that can hook to a special music stand or be carted around like a single piece of sheet music. 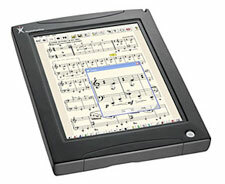 Officially, the product is a “music performance computer tablet.” My friend called me immediately to tell me about this space-saving and organized device. Digital sheet music for the MusicPad Pro can be purchased and downloaded from the website FreeHandMusic.com. If I understand the information on the website, there is also a subscription service where users can have continuous access to a music library for around $50 per month. Upon further research, I’ve learned that my comparison of the Music Pad Pro to a Kindle is actually quite common — so common in fact that FreeHandMusic has now made their sheet music available for purchase on the Kindle. Since the MusicPad Pro retails for around $900 and the Kindle around $300, I believe the Kindle is a better deal since it also has the ability to download books, magazines, newspapers, blogs, etc. However, you can scan your existing sheet music into the MusicPad Pro and you can annotate and make notes on page — neither of which you can do on a Kindle. Irrespective of which digital device might be of interest, I think both are an organized solution for young musicians who are just starting to acquire a sheet music collection. If digitizing your sheet music collection isn’t your forte, you might consider spiral binding your music. Organize your routine with fun daily checklists. Amanda Wiss uses checklists to teach her 3-year-old how to get ready for pre-school. For the morning, she includes: brush teeth, take vitamin, eat breakfast, get dressed, put on shoes. “Charlotte is exceedingly proud of herself for doing all the things on ‘her list,'” she says. Older kids can have more advanced checklists that include completing homework, practicing a musical instrument, setting the table, putting out an outfit for the next day–anything you’d like your child to consistently complete. Update lists to incorporate new activities and goals. Check out the other eight great tips for even more ideas. It’s easy to buy duplicate items that perform the same task when you don’t have a solid understanding of all the bells and whistles of what you already own. Whether it’s software on your computer or utensils in the kitchen, you should take the time to learn all there is to know about what you have. If you can’t see the video automatically, check out the clip on YouTube directly.